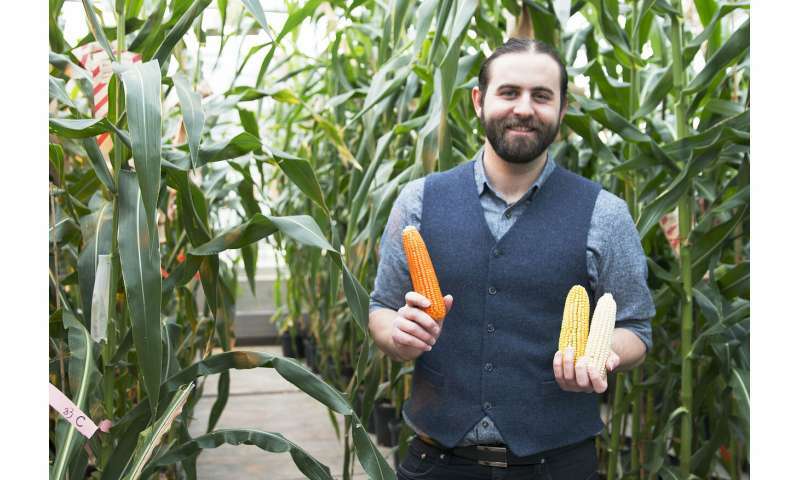 "Orange corn," a more nutritious, naturally selected variety of corn is now available in the U.S. markets through Purdue-affiliated startup NutraMaize LLC. Torbert Rocheford, the Patterson Endowed Chair in Translational Genomics for Crop Improvement in the Purdue College of Agriculture's Department of Agronomy , used a process known as biofortification to naturally increase the amount of antioxidant carotenoids in corn, making the corn more nutritious, and creating a deep orange color. The human body converts certain provitamin A carotenoids, such as beta-carotene, into vitamin A, an essential vitamin that promotes eye health and supports the immune system. "The project began as part of an ongoing humanitarian effort called HarvestPlus to improve nutrition in developing countries," said Rocheford, who began working on naturally increasing the amount of health benefiting carotenoids in corn over 20 years ago. He did not originally plan to market the orange corn in the United States. However, when orange corn varieties were introduced in Africa, some began to ask if it was grown and consumed in the U.S. When they were told it wasn't, some were skeptical, questioning "if it is so good, why don't American's eat it?" "So, I decided to grow some here and share it. The response was overwhelmingly positive. I had people tell me that the orange corn made the best grits and cornbread they had ever eaten. So I thought it made a lot of sense to offer it to Americans, especially since it might help encourage adoption in Africa." Rocheford and his son, Evan, co-founded NutraMaize to commercialize the corn in the U.S. NutraMaize is marketing the corn under the brand name "Professor Torbert's Orange Corn," and it is available at ProfessorTorberts.com. "The name of the product is a homage to my father's lifelong dedication to improving the world through science and agriculture," said Evan Rocheford, NutraMaize CEO. "People have described our corn products as having a rich, kind of nutty, buttery flavor," Evan Rocheford said. "Although it sounds like a relatively simple idea, it's actually quite revolutionary when it comes to a staple crop like corn," Evan Rocheford said. "We are actively breeding and developing varieties that speak to the two qualities consumers care about most: taste and nutrition." Because corn is used in a wide variety of popular food formats in the U.S., including tortillas, chips, and cereals, improving the carotenoid content of corn provides an opportunity to significantly increase the amount of the beneficial antioxidants Americans consume without changing consumers' eating habits, Torbert Rocheford said. The startup company has received a Small Business Technology Transfer Research from the National Science Foundation, a Small Business Innovation Research from the USDA, and matching grants from the state of Indiana, totaling about $425,000. Before NutraMaize licensed the technology, Torbert Rocheford's lab also received a $25,000 grant from the Purdue Research Foundation-managed Trask Innovation Fund, an endowed development fund to assist faculty and staff whose discoveries are commercialized through the Purdue Office of Technology Commercialization. "When it comes to supporting innovation and economic development, Purdue University and the state of Indiana really put their money where their mouth is," Evan Rocheford said. "Having a support network like this really makes a huge difference when you're trying to build a company from scratch. We are proud to call ourselves a Purdue Foundry startup and call Indiana home." ... developed the orange corn using traditional genetic modification techniques, rather than high-tech genetic modification, making orange corn just another genetic modification from teosinte. @Doug: make a currently existing GMO crop plant by breeding and then let's talk about it being the same process.